We use the internet for everything these days. And now with smartphones keeping the internet with us at all times, there are plenty of ways we can use the internet for saving money on our grocery shopping. Here are the top five apps for saving money on groceries. We need a list to go grocery shopping, correct? Well, we should have one. That right there is a huge money saver. Getting only what you do need and nothing you don't, but keeping up with the list or remembering to bring the list with you is always my downfall. I do always have my phone, though. And with ZipList, all of my list making troubles are over. Not only is this great at keeping your recipes all in one place, but it can help you create a shopping list with the items you need. It can even organize your list based on the layout of your store. What better way to keep those impulse buys at bay? This app is great for more than just your grocery shopping. Really, it's no wonder that newspapers are struggling so mightily in this information age. This takes away the need for your weekly Sunday paper. You can get all of your local stores weekly sales and deals right there on your phone. This way you can decide where the best place to shop for what you need is right at the touch of your finger. This is another grocery list which allows you to check off things as you go. You can completely customize and sort your list. You can even use your phone to scan the barcode to add things to your list. But on top of that you can also find coupons for the items on your list. No more forgetting your coupons when you go shopping. This is more ways to get coupons. SavingStar will take all of your stores loyalty cards and store them and give you exclusive savings on the items you purchase. You can get ecoupons to use. No more coupon clipping with this app at the ready. Beyond that, you get savings when you shop online at places like Groupon, Travelocity, LandsEnd.com, and ProFlowers. This might be the perfect app for everyone. There's really nothing for you to do. 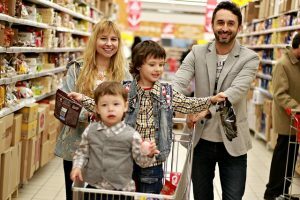 It will alert you to special savings as soon as you walk into a store and automatically loads coupon savings onto your loyalty card so you no longer have to worry about those coupons. It's just that easy to save money on the things you buy. This will even work at restaurants, department stores, and entertainment as well. Grocery shopping has really gotten much easier with all of these great coupon apps you can add to your phone. And you'll never forget your list again. With your lists stored into these apps, it will make it that much easier to remember all of the ingredients you need to make your favorite recipes. Saving money using the internet has become so much easier. Aside from using your phone and apps, don't forget that a Google search will often reveal helpful coupons and where the best sales are. So make the internet a part of your weekly grocery shopping. It will not only save you time, but it will also save you money.